In recent years, the surprise success of some independent films such as Gosford Park and Bend It Like Beckham has encouraged more people to consider investing their money in films. Bend It Like Beckham grossed more than £35m at the box office. And the industry as a whole appears to be bucking the economic downturn. This summer, audience figures have remained high for blockbusters such as the new Batman film, The Dark Knight. But the movie industry is notoriously risky and some experts warn that if you invest, you may lose all your money. In this week's programme Alvin Hall ventures beyond the glitz of Hollywood and into the business of independent film in New York and London. He meets film producers and other experts from the industry along the way to see just how the movie business stacks up as an investment opportunity. There are some enticing tax breaks on offer, but does this make the gamble worthwhile? 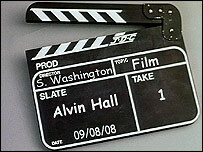 Alvin Hall's World of Money: Film was broadcast on BBC Radio 4 on Saturday 9 August at 1204 BST. A longer version of the programme was broadcast on Monday 11 August at 1502 BST. Lights, camera, a cut of the action?